Urethane foam is a way of sealing your house that is created on-site in one application by a spray foam contractor. The liquid application quickly transforms into a rigid, seamless closed cell plastic. It is nontoxic, reduces outside noise and prevents air leaks (like around windows and outlets). It provides the highest R value per inch (6.8), strengthens the overall house’s structure, retards insect penetration, and it will not settle. When combined with a conventional blow-in or batt insulation it can lower your heating and electric a/c bills and increase the resale value of your home. 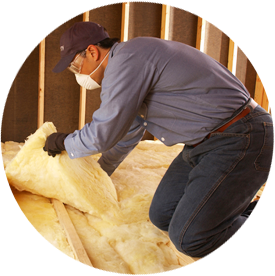 Cellulose blow-in insulation has an R-value of 3.7 per inch, 60% greater than blown-in fiberglass insulation. The Cellulose Cocoon Insulation by GreenFiber that M&D installs is a dense product, filling gaps and voids and creating a quiet, comfortable home. It is made up of 85% recycled newspaper fiber and insulating a typical 1500 square foot ranch style home recycles as much newsprint as an individual will purchase in 40 years. Fiberglass Loosefill is also a “blown-in” insulation.n. Its used in new construction and in older existing homes, typically in hard-to-reach areas. Since fiber glass insulation is non-combustible and non-corrosive by nature, PINK fiber glass loosefill insulation offers significant advantages over other loosefill insulation products: it will not settle or lose its energy-saving abilities over time, it does not require the addition of fire-retardant chemicals that can promote corrosion of pipes or wires and it will not rot or decay, support fungus or mold growth, or provide sustenance for insects or vermin. Fiberglass InsulationTraditional fiberglass batt like that made by Owens Corning can be used entirely for insulating a new home or in combination with other insulation. Made of sand and recycled glass it is naturally non-combustible, will not settle if installed correctly, and one of the few types of insulation that a homeowner can easily install themselves. Hiring our experienced M&D Insulation installers to do the job though saves you time and hassle!